My January has been a whirl, I tell ya. Looking after someone who is recuperating is not hard, but it requires adjustment in focus. The cure for my malaise is obvious: start something new. A clean slate, fun choices, and the tantalizing possibility of perfection. So, I’m plotting, planning and swatching for my Bang Out a Sweater project. I feel the life force of knitting returning to me. The start of Bang Out a Sweater is February 1, only a week away! Pre-swatching is not only allowed, it’s encouraged! My process started with deep contemplation of my yarn choice. 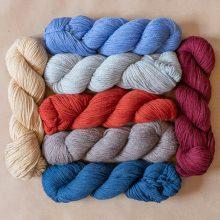 We’ve got lovely wools in the shop, all of them proven to make a stunning Norah Gaughan cable sweater. But I’m feeling kind of spring-y. I’m also experiencing early-onset nostalgia for Rowan Denim, which the company has announced it is discontinuing. Rowan Denim knits up perfectly to the stitch gauge of the sweaters in MDK Field Guide No. 9: Revolution. More importantly, cables are the absolute best way to show off the exquisite fading that happens when you wash and machine-dry Rowan Denim. Exhibit A: my Whitby Pullover in Rowan Denim. I made it in 2013, in the darkest shade of Rowan Denim. 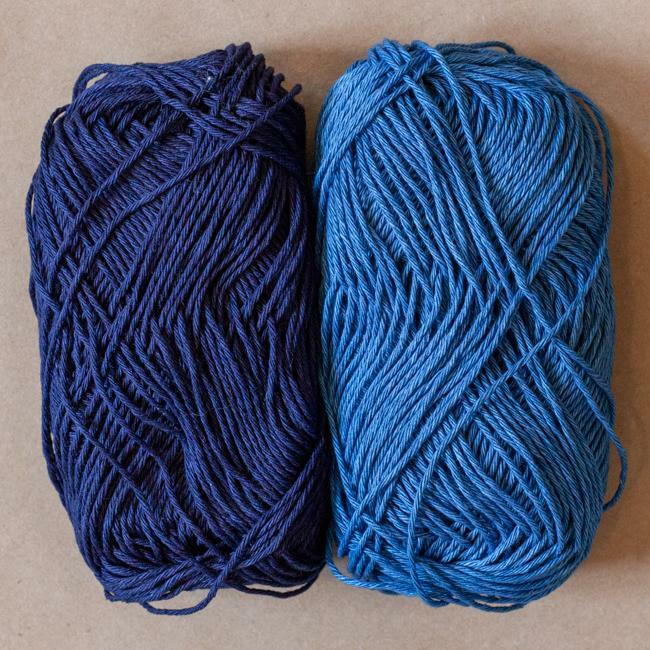 Photo by Patrick Gottelier from Indigo Knits: The Quintessential Guide to Denim Yarn. My Whitby is slightly modified from the original, but you get the idea. The fading is magnificent. I wear my Whitby daily whenever temperatures permit; it’s my House Sweater, and my cover-up-my-gym-clothes sweater. I’m wearing it right now. It’s a smooth and silky cotton hug at this point, after five years of washings, dryings and wearings. In idle moments, I pick apart the whitened coils of the tight rope cables, to admire the deep, inky indigo that’s still there, hiding in the crevices. I want to see one of Norah’s magnificent cables in full Rowan Denim glory. All who are mourning the end times of denim yarn, join me! I promise we will all hold hands for the part where we figure out how much length to add to the body to account for the shrinkage. I’ll spare you my dithering, which has been tedious. 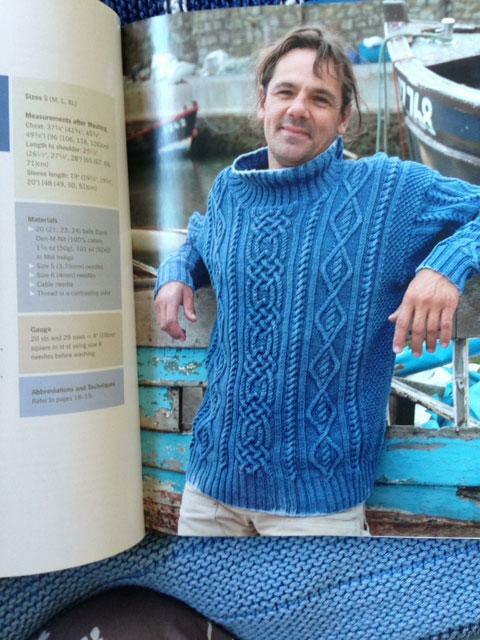 I love all of the cable options available for this knitalong, both in Field Guide No. 9 or in Norah’s Interchange(ability) collection. It’s hard to choose, so I go around and around, revolving. In the end, I reminded myself that this is not the last cable sweater I intend to make in my life. I decided to go with the one that my eyes kept landing on from the very start: the Calligraphy Cardigan cable. Other cables may be twistier, which means more cable-knitting practice, and more nooks and crannies where the dark denim could lurk as the fabric fades overall. But I love the sweep of Calligraphy’s long curves, those tapered points at the ends, and the medallions of reverse stockinette stitch. So, Calligraphy it is. That is my final answer. Ugh! This is the hard part. If I go for the fastest-to-bang-out, I think it’s got to be a pullover. With Norah’s top-down construction, when you’re done knitting the pullover, you’re done. C’est fini. Put it on! But I love a cotton cardigan for warm-weather layering. And if we’re gaming the knitalong, or being calculating, it has to be said that the short sleeves of the Calligraphy Cardigan eliminate a whole lot of stockinette, leaving ample time for the finishing details of a cardigan. photo by sara remington. The photography sample is in Periwinkle Sheep Merino DK, in the shade Hydrangea. 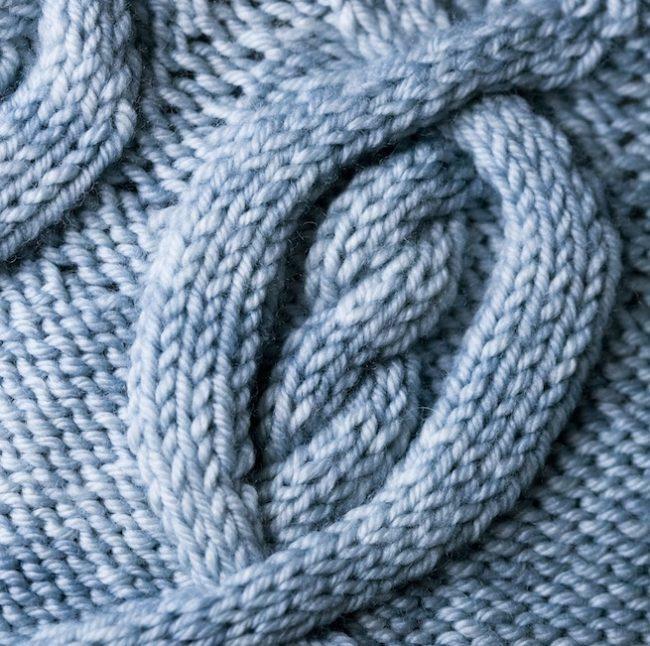 It’s possible that the pale blue of this image is what gave me the idea of knitting my sweater in Rowan Denim. Surely I can muster the gumption to make a few buttonholes! And if I end up with time to spare in late February, I can ponder lengthening the sleeves to 3/4 length, my favorite. Just finished Row 26 of the cable pattern. Closing in the bottom of the O.
can’t wait to wash and dry this puppy and see it even out. I’ll be using the darkest shade of Denim, Nashville, for my sweater, but I’m swatching with leftovers of the lighter shade. All denim gets lighter, eventually. Whee! I’m off to the races. I’m excited to get going on this knitalong for real. February is coming! Let's Bang Out a Sweater! Thanks for sharing, Kay. I’ve been thinking about the denim in my stash also. I have not knit with it before so I was concerned about adapting the pattern to the shrinkage. If others are going to go with denim, I’m game. What size needle are you using? A calligraphy short sleeve in denim is really tempting, Kay! Now you have spread the bug…. Benedetta you have always been susceptible to Denim’s charms! Hi Pam! I’m using a US 5. Experience has taught me that my after-washing gauge gets pretty close with a US 5. I’m a loose knitter, so I always go down at least one size from the recommended needle. I need to remember this. Buttons over snaps is brilliant. Much more durable. This is something I’ve done on my last few cardigans. A cardigan that stays done up is one less irritation in my view! Faff free dressing at its best. Oh, dear, bitten again………..er, I mean, Inspired Again! Yes! Rowan Denim! Yes, Calligraphy! Now, how much new RD will I need to supplement what I have……. Discontinue, re-launch, change and mess up… that’s what they are always doing with denim. 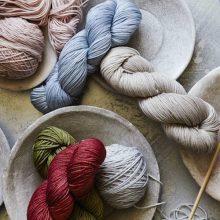 Perhaps I need a walk up the hill to the LYS that has it on sale and stock up, just to be sure of things! And, maybe even knit something with it! Can’t wait till I am a good enough knitter to do this! Brenda, the cool thing about knitting is that once you learn knit & purl, EVERYONE is a good enough knitter to do ANYTHING! It may take a little longer, with a little more thinking involved (and lots of learning). But I say just jump in! You have nothing to lose but your anxiety! What Martha said! And it’s only yarn — you can rip and redo when necessary. Bang out….blah yaya….cables….yaya blah… WAIT. ROWAN IS DISCONTINUING THE DENIM???? NOOOOOOOOO. Sounds like a good idea! 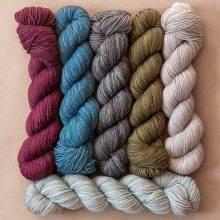 I have a kit for a fantastic shawl with intarsia leaves (main color a denim blue)that I plan to work on most of February. My husband is having surgery requiring a 6 day hospitalization,,so I’ll have time to just sit and knit while I keep him company! Then if > Have time, I’ll work Mon the adorable short sleeves cardigan with t.he cables. Hope to meet you all if I can get in to the NYC Vogue Knitting Show! Woke up, read the email, ordered yarn and a pattern for sweater to join a KAL. What a wonderful way to start the cold gray day. Now which of the three projects on needles do I work on now? I just found this wonderful site on a recommendation by my LYS and I may be hooked. WHEEEEEEE!! This is EXACTLY my choice! 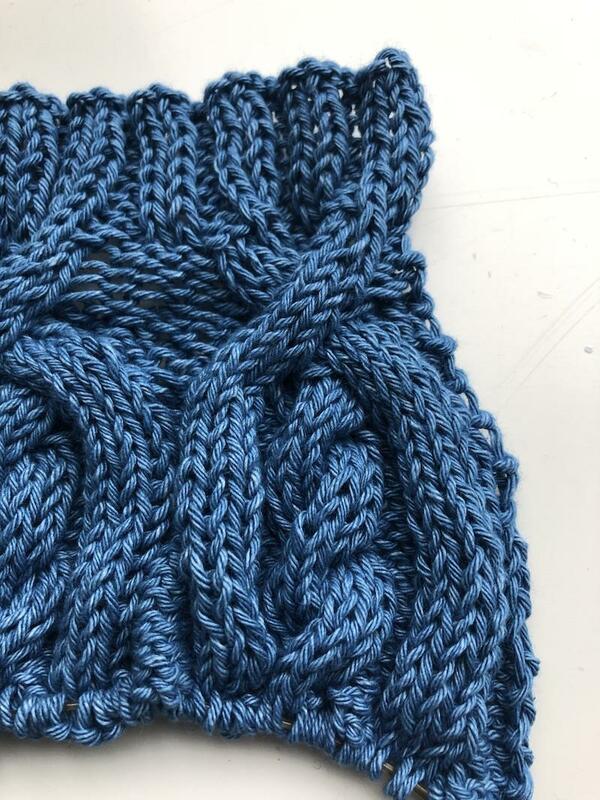 I bought my denim yarn a couple weeks ago from MDK (naturally), and I’ve been swatching too. My swatch is decidedly less…. perfect… than yours. 🙂 I’ve had to fiddle with different size needles to come close to gauge (can you believe, I am down to US 2 needles??) I’m still not really on the pattern’s gauge, but since it’s top down, I’ll adjust as I go. I have never worked with denim yarn but read a lot about it on MDK and I *think* I can do this. It’s my first time knitting with anything other than wool or alpaca blends – it’s a nice experience. The denim cotton is crunchy, a little stiff, and not at all unpleasant. Thrilling news, Wanda! I cannot wait to see what you come up with. It sounds like you’ve already got a handle on the nuances of working with denim yarn. Mmmmmmm. That denim swatch is gorgeous! My goodness, discontinuing Rowan Denim! I never thought I’d see the day, as they say in the old discontinued movies. That’s a great choice, Kay, doing that pattern in the Denim, and with longer sleeves. A gorgeous choice. I love Denim too but every sweater I’ve knit with it has been HUGE despite me following the right directions size wise and getting gauge. I love the sweaters it makes but after having to give up a beautiful Alice Starmore cable I made because it was huge (totally unwearable for me but it went to a good home) I was finished. I’m enjoying this thread because it raises the old question, process or product? There is something that just seems “wrong” about banging out a sweater….it sounds like a value judgement and isn’t meant to be…I guess it just makes me feel uncomfortable to feel that all that luscious knitting is something to rush through so I can say I finished it within the time limit. That said…hope those who participate enjoy! Not my thing so I will knit quietly on the sidelines and watch you speed demons …… and be jealous when you’re finished and I still have sleeves or more to go! When you say the gauge works, I assume you mean after it shrinks. Any idea what the prewash gauge is? I’ve been hoarding some denim for a long time. It’s hard to measure pre-wash gauge on this swatch until I get to some plain stockinette, so I’m kind of going by faith and long experience. Denim only shrinks in length, though, so you want to get 20 stitches over 4 inches on the pre-wash swatch. After washing, it might tighten up by a half stitch over 4 inches. but it really does only shrink in length. I do not understand the science of this but I’ve measured it in the past. That’s why it’s easy to substitute denim in lots of patterns that weren’t written for it: you only have to adjust the length of the garment by knitting more rows to account for the anticipated shrinkage. Otherwise you just follow the pattern. Just wondering….would you add rows to the body of the sweater systematically or just at the bottom length. I had decided on the elliptical-hem pullover from Interchange, but couldn’t decide on a wool color. Kay, your post reminded me that I have been wanting to make a denim sweater, so I just ordered some to use on this sweater. I ordered what I hope is extra yarn for the shrinkage factor. I’ll be late to the KAL, but will be watching to see the details on figuring that. Cotton is so much more practical for Alabama, although I have made bunches of big woolies in my knitting “career” and still have and wear them -some as old as 25-30 years. It’s cold here now, so I’m wearing one of those almost everyday, but hope that the denim will be a four-season garment for me. I just retired, too, and casual will be more useful. Lots of times my sweaters come out “dressier” than I intended. Shouldn’t be a problem with this one! It has to be really cold for me to feel like it’s too cold for my Whitby, but this is the time of year when it occasionally happens. And I love having a sweater or two that I actually can wear in summer, in AC or after sundown, or in June and July in coastal areas. 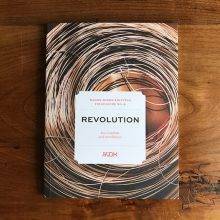 I’m so envious…for your ability to bang out a Revolution, and for the Rowan Denim! I really wish I could participate in this KAL, but I am trying to get in a different sweater I promised myself I’d make in time for EYF. So, I’ll be BOAR-adjacent, banging out my Milkweed sweater and cheering all of you bangers on! That’s the spirit, Jen! Bang out SOMETHING. I too will be BOAR-adjacent! Attempting my first sweater, in gorgeous Hektos I will be excitedly following everyone’s Revolution progress in the Lounge!! Discontinuing?!?! Again? I still have a moderate stash of the original (inspired by you and the Gotteliers), but lordy. FWIW, I think Calligraphy in Denim will be fabulous. Sometimes it feels like they are doing it on purpose to cause me emotional stress! Why Rowan why? I promise to look for another source for the stuff, in case we Denim lovers ever really do get through our stashes and need to get more. It is hard to imagine any denim yarn as beautiful as Rowan, but I did see Den-M-Nit by Elann at elann.com. Is that a feasible option? I love the plan and may have to 100% copy! 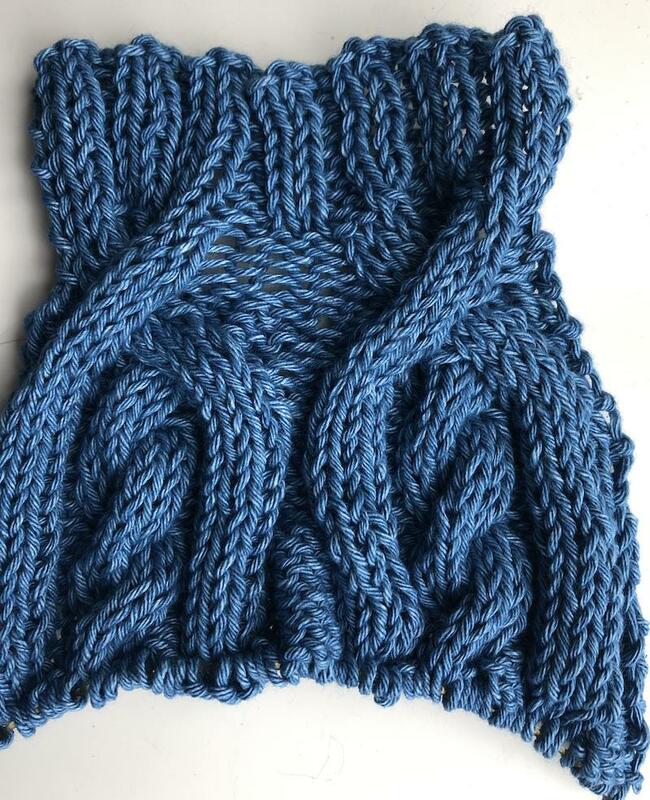 Well I was just kinda sorta thinking of taking up knitting again (learned as a pre-teen from my mother) haven’t made any thing in decades but have been inspired. Per one of the other posters, if you can knit and purl ….. so I’m going to the store today and pick up some supplies, hit youtube to reacquaint myself with the basics and try to keep up with the rest of you in February. Let’s hope all this inspiration lasts till the finished product. Kay, there you go reading my mind again! Oh why did I read this post? I bought a bag of Rowan Denim when I first started knitting for a Kat Coyle skirt pattern that I never started. The extra skeins were at one point going to be a marvelous faded Clapotis (another fabulous Kat Coyle pattern!) where I was washing after each skein so it would be a Fade before fades were a thing, and I made it through three skeins before I decided I didn’t like the fabric of the wrap and it was going to take more extra skeins than I had… so maybe they can all become this sweater!!! Hmmmmm. Kay I think you have done it to me again. Yes! This sweater, in denim, with 3/4 sleeves…perfect! Though the model looks beautifully cool and comfortable in her cardigan, cap sleeves were never my favorite, even before, as Nicole Hollander says, “the flesh of my upper arms began moving independently of the rest of my body.” I look forward to the progress reports on this sweater. How about this new yarn Rowan Denim Revive? 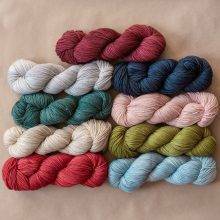 My LYS had already announced it coming! That is a beautiful swatch! But how does one measure gauge on those beautiful cables? I can’t find a definitive answer…unless I’m missing something in the Lounge discussion or elsewhere. So what would be a comparable yarn if one can not locate the Rowan specialty yarn? After reading this letter, I immediately bought up what the shop had left, he he. I plan to cobble together several orders from a few online shops & finally make my picket fence afghan, but I’ll have to switch the Memphis for the Nashville in the pattern, and vice versa. Plus I bought enough black Rowan denim to make a Whitby later. I’m afraid I’ll be banging out a picket fence instead of a sweater guys! But they’re both MDK patterns, so I guess it counts ;). Love these cable patterns but I’m so new to substituting and interchanging patterns. 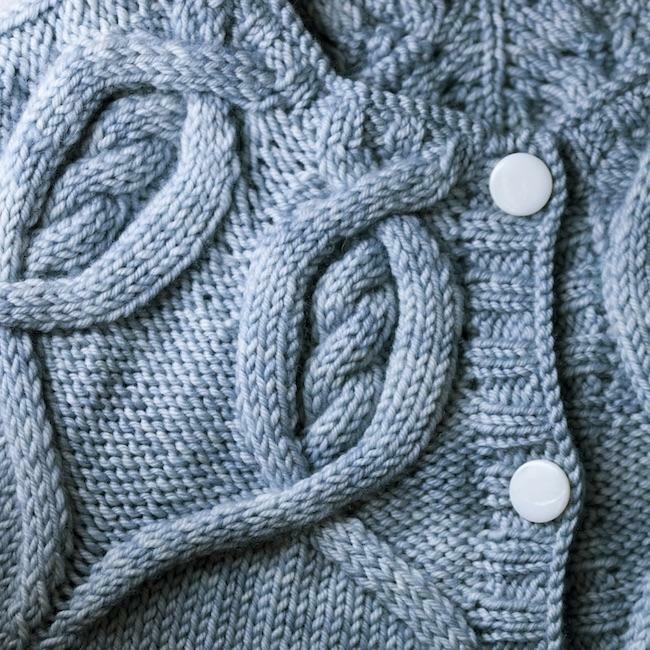 Can I do the calligraphy pattern as the time of the elliptical pullover? Will that work? Thanks for the help.